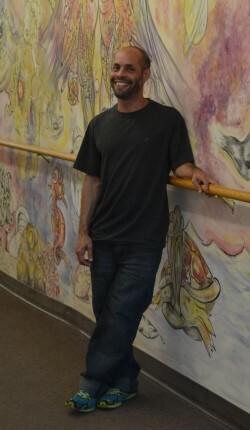 Ron Passerello stands in front of the mural he painted in Tranten's. Someone You Know, written by Amber Kapiloff, is a new column spotlighting the good people of Franklin County. It isn’t common for someone to know from a young age just how they want to spend their time and energy in the world. It’s a question that most people spend their entire lives trying to figure out and when they finally come to their conclusion it is usually far from what they may have said as a kindergartner. When Ron Passerello was only 5 years old, going to school in western Massachusetts, he knew what he wanted to do with his time. Every day, as soon as he completed his work sheet in class, he would find his way to the crayons and colored pencils and blank paper to draw. Other kids may have wavered between the blocks or the board games but Passerello didn’t have any hesitations. From then on color and creativity steered Passerello’s passions. At 7 years old he moved to Panama where he lived for the next 8 years of his life. Ron Passerello is a growing creative force in Farmington. “Living in Panama had a huge impact on me, especially the way I look at things. There was advertising everywhere, mostly in reds, blues and whites which are Panama’s colors. Even the city buses were painted over with a graffiti style of advertising,” Passerello explained. Most people in Farmington might recognize Passerello from working at Soup for You, and previously Java Joes. When I was in High School he would serve endless bagels to my ravenous friends and I and would put up with us trying to secretly tear pictures of hot actors out of the magazine selection. So it’s an understatement to say that Passerello has put up with some tedious jobs in order to support his passion. You can buy a sandwich from him at lunchtime and then walk down the back hallway of Tranten's to see his true calling. Passerello and I are sitting in the park next to the gazebo in downtown Farmington. Looking around it’s not an exaggeration to say that pretty much everyone here is white. Passerello and I talk a lot about diversity, culture and racism. What it means to feel at home. After Panama, Passerello moved back to Western Massachusetts where he attended high school and eventually college. “I had this great teacher that encouraged all of her students to apply to Greenfield Community College. So I did and I got in.” After a year of college Passerello’s buddies started dropping like flies. Eventually he realized he didn’t know anyone around him and he too decided to leave. He moved in with his father just outside of Boston where he eventually applied and was accepted to the New England School of Art and Design. The following few years Passerello did some of his best work before moving to San Francisco with friends. “I thought Pamela Anderson would just be lying on the beach there. It wasn’t what I was expecting, not immediately anyway,” he said. In Passerello’s world everything has been and always will be about art. 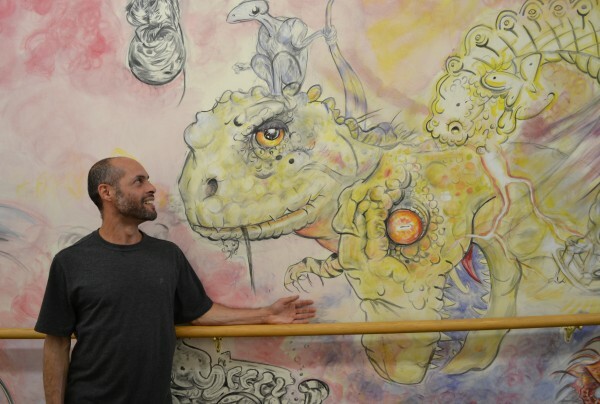 If you are interested in strengthening your creativity you can find Ron Passerello at Up Country Artists every Monday from 6 p.m.-8 p.m. where he teaches a drawing class. Additionally, if you have any blank walls or buses that need some color you should find him. What a nice column about a realy nice guy. I would like to see one about Princess, the shelter cat who came to stay whose forever home is Aubuchon Hardware! Bulldog, what a great series! I do know Ron but only by sight, which I think is your point. I am glad to know this much more about our active neighbor who is contributing to our community. I hope he won't feel burdened by the multitudes who now feel we know him well enough to say "Hi!" Looking forward to more stories by Amber Kapiloff. Thanks. WOW! That looks amazing. I've enjoyed your artwork that's been on display at Soup for You. Now I'll go to Tranten's to enjoy this. I hope we see your work at other places around town in the future. Great column about a great person and very talented artist. Well done! You captured this beautiful soul so well! You are so loved, Mr. Passerello! I enjoy that mural--what a wonderful artist! I have seen Ron working in the restaurants and I have seen and admired the artwork in Tranten's, but I did not put the two of them together. Great work, Ron! Thanks for this story, Amber. Great job, Amber! I'd always wondered who painted the interesting mural. It's nice to live in a "paradise bubble." I like this kind of feature. And I like these kinds of people. Nice artwork, Ron. Well written, Amber. Amber, you are doing such a great job highlighting very interesting people in our community. Dot is awesome, and so is Ron. I can't wait to see who you choose next. Amber, I agree with Nate . Nice job. Its awesome to put a name to Rons face....see him around town all the time! What stunning, beautiful artwork. Seems like there must be children's books, Ron, that beckon your illustrations. Good job Amber , there are so many interesting folks around with many great stories. Ron is a prime example of a humble but very talented member of our great community ! Nice job , great painting, and aren't we lucky to have him in our town! I would love to read about Bob Underwood . I Love it when he dresses up in his highland kilt and entertains Farmington with his Bag Pipe Music. I Love it when the Fall buses come in to town and he was out there to greet them!